My friend Kristin Drake is a first grade teacher at McGilvra Elementary School. When she invited me to deliver a global lesson to her public school class of 24 students, I responded with great enthusiasm. I looked forward to being in an elementary classroom in a nearby neighborhood, becoming acquainted with some young learners, and sharing a bit of the world with them. As I entered the portable classroom behind the main school building, my first impression was of the best kind of chaos — a jumble of books and tables, lots of teaching materials, a corner for sitting together, and art all over the walls. I was heartened to see evidence of some of my childhood favorites: A large Charlotte’s Web made out of yarn with the word “Terrific” on it, Frog and Toad dolls dancing in a corner, and a stack of brilliantly decorated Rainbow Fish art projects. The students were expecting my arrival, greeted me warmly, and eagerly anticipated my actions, since I decided to surprise even my friend with the lesson. I chose the theme of caring for the earth, which turned out, unbeknownst to me, to be perfectly aligned with a lesson they had just completed concerning what gifts they wanted to give the earth. I began by gathering them in a circle and sharing with them a Thich Nhat Hanh poem I love: “Water flows over these hands; may we use them skillfully to preserve our precious planet.” They liked the poem, and they REALLY liked saying “Thich Nhat Hanh” over and over again! Their answers to a question about about all the different ways to travel amused me (“car, train, airplane, rocketship, scooter, submarine, feet”) and then I reminded them of two other ways: reading and using their imaginations. I showed them how I like to honor the places I’ve been through the jewelry, scarves, and other articles of clothing I wear, circling the places each object came from on a map as we talked. We continued our around the world tour through artifacts I brought from home to pass around, and then some photos from my travels, focusing on the children I met along the way. We discussed how you come to care about things you know about, and how travel expands what you know and therefore what you care about. The final part of the hour included them creating an art project where they drew some of the things they care about within an outline of the earth, and then traced their own hand, cut it out, and glued it over the earth to show them caring for those favorite things. We titled the work “The World is in Our Hands.” We ended our time together singing a new version of a song I learned as a child, changing the words from “He’s Got the Whole World in His Hands” to “We’ve Got the Whole World in Our Hands.” They had the chance to act out parts of the world we hold in our hands, from bunnies to mamas and papas to itty bitty babies. As the bell rang at the end of the hour, we said our thank yous and good-byes, and I could hear them singing the refrain as they filed out to lunch. You are never too young to become a global citizen. Children are capable of meaningful reflection and profound discussion. An hour is LONG and needs to contain many different activities with six-year olds! There is a lot of love in a first grade classroom. 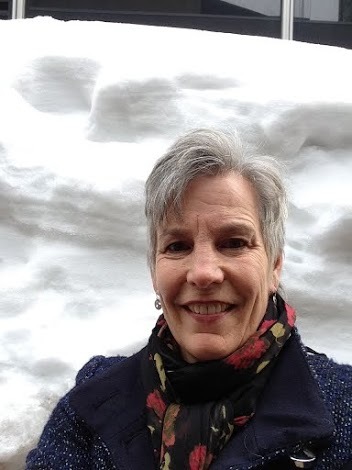 I just returned from attending the National Association of Independent Schools (NAIS) Annual Conference, held this year where the temperatures were low and the snow drifts were high. This in stark contrast to the warm temperatures, lack of snow (even in the mountains) and early spring in Seattle. Global climate destabilization indeed. Along with listening to inspiring speakers, attending edifying workshops, and networking with colleagues from all over the country and many parts of the world, I had the opportunity to share a new resource with the NAIS community. My colleague Willy Fluharty from Cape Henry Collegiate School and I introduced a book we co-edited over the past two years. Willy and I are both founding members of the Global Education Benchmark Group (GEBG) and have been active in the organization since its inception in 2008. At that time, four schools (Cape Henry, Lakeside, Providence Day and Charlotte Country Day) met and then at the behest of NAIS, invited 15 other schools to join us. We embarked upon a mission of benchmarking, sharing, and collaboration that has served individual schools, and also helped define and develop global education in all independent schools. Over the years, we have collected data to benchmark what GEBG schools are doing in their programs, created a Wiki page to share information, become a 501c3 entity with a Board (on which Willy and I both serve), and organized an annual Global Educators Conference. A couple of years ago, we realized we had learned so much through collaboration that would be useful to others outside of GEBG. We gathered resources from 24 different global educators representing 12 schools and 12 outside organizations, and compiled it into a handbook that GEBG published as an iBook available for $20 on iTunes. The first section of the book concerns itself with Why We Should Be Global, the philosophy behind the work including a compelling essay by Father Steve Sundborg, President of Seattle University who gave the keynote address at the first GEBG conference at Lakeside School. Next we created a chapter outlining a number of different ways to become global at all levels of K-12 education. Subsequent chapters deal with curriculum, collaboration, competencies, finances, and risk management. Finally, we included sample data charts from our annual survey and resources to help people develop their own programs. Our hope is that people will examine the book as a whole, and then use it, like the title suggests, as a roadmap for global program development. Rather than a rigid “how to” manual, we want it to be a guide to help clarify program goals and identify appropriate paths to those goals. Some readers may spend more time investigating the big picture questions of philosophy and pedagogy; others will dive right into specific sections on risk management and curriculum; still others will use the data to support their own desired outcomes. The book highlights a few trends such as the rise of global diploma programs, the need for better risk management practices, and the push to integrate global experience and classroom practice. Because the field of global education is relatively new and constantly changing, we plan to provide periodic updates. We are currently preparing it for publication on PC-compatible platforms and Kindle as well. A couple of talks I heard at the NAIS conference this year were particularly relevant to our experience editing the book. John Maeda talked about the importance of creativity, thinking outside of the box, and making bold choices without bowing to public opinion. We certainly dove into this project with no prior publishing knowledge, and we learned a great deal through trial and error. Sarah Lewis, who wrote The Rise: Creativity, the Gift of Failure, and the Search for Mastery described the difference between success (a single accomplishment) and mastery (consistent excellence) that comes only through continual examination of failure and subsequent adjustments. Willy and I encountered many obstacles, and while I make no claims about mastery, we did approach the process with curiosity and the belief that we could overcome any obstacle through persistent effort. It was a fascinating collaborative undertaking, and we hope it serves as a useful and enjoyable tool.